The 1884 Sanborn Fire Insurance Map shows the original 13 structures currently referred to as Rainbow Row along E. Bay St. at the top left corner of the map running from Elliot St. to Tradd St.
As young architecture students exploring the streets of Charleston, sketch books and (SLR) cameras in hand, Rush and I knew we were walking on hallowed architectural ground. Charleston's best of times and worst of times were visible in her historic structures - some preserved as museums, some renovated for current day functions, and the less lucky, waiting for their day of restoration. It was, therefore, a humbling moment when one of our wonderful clients asked for our assistance with a renovation to 107 E. Bay Street, one of the 13 historic and connected structures, currently known as Rainbow Row. Originally designed and built as stores on the ground level and merchant's living quarters above, these buildings served Charleston's port and directly fronted the Cooper River. (The water's edge at this part of town has since shifted away.) As row houses, they mostly share a party wall in between houses with private access to the residences from the rear alley. Subsequent fires, the effects of the Civil War and the earthquake in 1886, all gave these buildings scars, dark chapters and in some instances a complete rebuild. The buildings from 79 - 107 East Bay Street were originally designed as shops on the ground floor and residences above. 107 East Bay is located at the corner of East Bay and Elliot St. and is the start of the 13 attached structures that is now called, "Rainbow Row"
"In the pre-Revolutionary period this was the site of George Flagg's paint shop, which stocked pigment and oils for the painting of Charleston's houses. After the structure was destroyed in the fire of 1778, Flagg sold the empty lot in 1791 to John Blake." 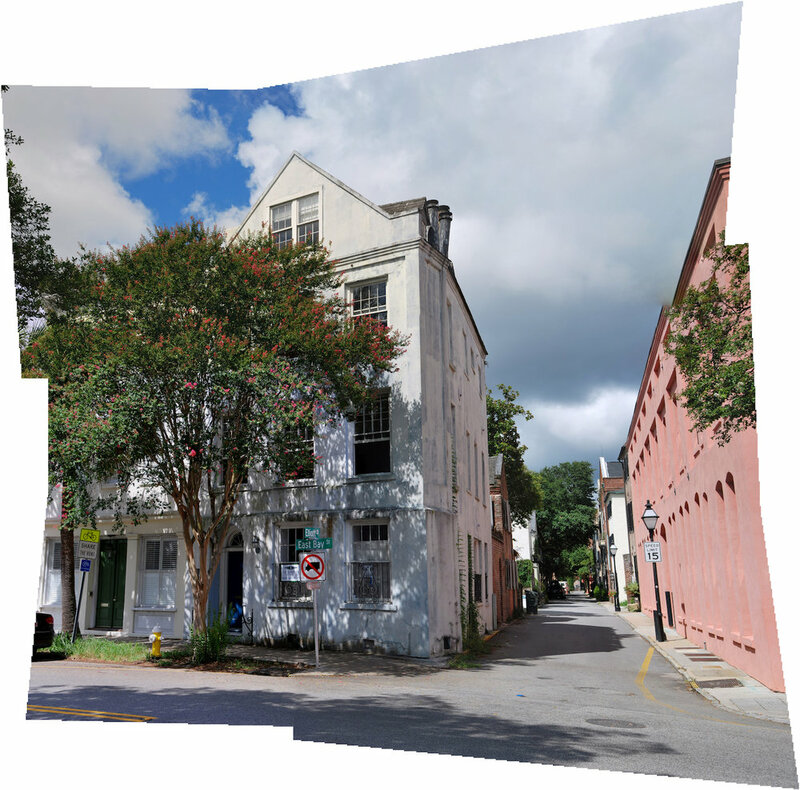 [Jonathan Poston, The Buildings of Charleston] As evidenced in the photo comparison, the building was once had a hipped roof which was altered to have a gable parapet wall. Alterations through the decades are common place as buildings undergo repairs, adapt to new families and functions. The entire Rush Dixon Architects studio is humbled to be a part of the team for this next generation of 107 E. Bay which includes the very talented design and construction stewards, Brett Elrod (C. B. Elrod Construction) and Cortney Bishop (Courtney Bishop Design). We look forward to updating you on construction and design progress. 1 Elliot St is a brick out-building associated with the property. Rush Dixon Architects is a solutions-based, contemporary architecture and design firm. Results driven, we create value for our clients through designs that are both strategic and artful, always keeping client goals at the forefront. We believe that modern design is not found solely in the materials, but rather through the pursuit of better spaces for living and doing business. It is truly a privilege to be a small part of someone's incredible journey. In this case it was the accounting rockstars (yes, that's a thing) at Accountfully, a fully outsourced, modern accounting firm in Charleston, SC that focuses on entrepreneurs, small businesses and start-ups. They out-grew their current office space and were in the process of purchasing 533 Rutledge Ave. for their new headquarters when we first met owners, Meredith and Brad Ebenhoeh. Our scope included reimagining the existing first floor layout for optimum operational flow, function and brand alignment as well as assembling a Permit Set of documents for the City of Charleston to review and approve prior to construction. The exercise of taking this historic gem and ensuring a relevant, future chapter is one of the best things about being an architect in Charleston - designing how modern and current functions can exist and thrive within historic walls. The collaboration that followed yielded a work environment tailored to how Accountfully functions: a beverage bar for both staff and clients as a welcoming feature, the generous meeting space, a mix of private offices and open work spaces. The impeccable taste and instincts of our clients perfectly captured the Accountfully brand.